Music is not often reinvented, on of the few innovators was Quorthon from Bathory who single-handedly created Viking metal in the late Eighties with his two masterstrokes Hammerheart and Twilight Of The Gods. Many bands tried to adhere to that sound, although none ever achiever the Nordic majesty of the original. With Quorthon having sadly departed for Valhalla, two musicians decided to pay tribute to the special sound of middle-period Bathory. Fenrir from Norway and Vali (also a member of Italian doom kings Doomsword) recorded the first demos in under a week and left the studio with three long tracks, of which the three-part suite Ragnarok is the heartpiece of the album, which was partly re-recorded from the demos with Gungnir (also Doomsword) and Nidhoggr. In the end only the original vocals were left, and Nidhoggr composed a short intro, which is followed by the dynamic The Day Odin Stood Still. Even if you normally don't read about a band's influences, only deaf people would miss the Bathory parallels here. 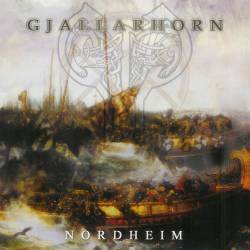 The vocals sound as if Quorthon were still among us, and even the production has this warm yet slightly underpolished feel of the early Viking classics. From there on, we are treated with the nearly twenty minute long Ragnarok, before the ten minute 200 Years Of Fury ends this excellent album way too early. Nordheim is anything but original, Gjallarhorn even proudly claim their musical roots, but the dedication these four guys use to create this majestic piece of plastic is unparalleled in musical history. The fizzing guitars are backed by a surprisingly melodic bass guitar, the drums may very well have been programmed but assume enough life of their own to not disturb the overall atmosphere. True enough this never surpasses Bathory in their best moments, but if this had been a Quorthon album, it could have unashamedly stood as the third best in the series. If you believe that only originality deserves high ratings, then you must disagree with me on this album, but people who grew up with elegic Viking metal like me, or who discovered it only later because they were yet too young in the late Eighties, must consider Nordheim one of the truest and most moving metal albums ever.